XIII – La Treizième Heure is both Mathilde Laurent's favorite and mine, and the question it sets out to solve could be this one: how do you translate the very essence of perfume, its historical and etymological origin, smoke, without resorting to “archeological” materials (as, say, Serge Lutens did with incense in Serge Noire)? Several materials express smokiness and/or “burnt-ness”: vanilla has a smoky facet; so do black tea, eugenol (clove buds, lilies) and licorice; in fact, anything that smells phenolic (coal tar) or cresylic (birch tar, whiskey). In La Treizième Heure, Mathilde Laurent has bridged the gap between vanilla-smokiness and leather-smokiness with yerba maté, itself a smoky/phenolic note; the black tea effect is topped off by bergamot (familiarly associated with Earl Grey tea). Bergamot, vanilla and leather? 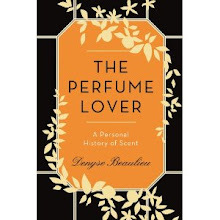 Add hay and balsamic notes, and you’ve got Shalimar, a scent Mathilde Laurent knows inside out since she authored Shalimar Eau Légère (and weighed the materials of vats and vats of the original). Like Annick Menardo’s Bulgari Black, La Treizième Heure could well be a post-modern spawn of Guerlain’s iconic perfume. But instead of filling out the heart with coumarin and sweetening the base with balsam, Mathilde has pinned her carrousel of smoky-burnt notes onto the dazzlingly complex scent of Monique Rémy’s narcissus absolute. Like coumarin, narcissus absolute presents tobacco-hay facets, along with a “horsy” aroma; but it also gives off an aqueous green smell that gives the smoky Treizième Heure an oddly icy heart (at that point, the combination of coldness and leather conjures the smell of a watch: the wristband and the metallic timepiece— of course, this is Cartier). This unexpected shape-shifting somehow suits a scent named after an unlucky number and a non-existent hour, built around a flower intimately tied to the netherworld in Greek mythology… After all, narcissus was born of the metamorphosis of a beautiful youth so in love with his own reflection that he drowned in it. And it was lured by its sweet smell that the goddess Korê fell into Hades’ trap, and was swept by the enamored god into the abode of the dead… La Treizième Heure’s secret name could be Persephone. I’ll wear it on Fridays. Mathilde Laurent will answer readers' questions on Elisabeth de Feydeau's blog. This is a great initiative and I can't encourage you enough to take advantage of it! Just click on the link. Image drawn from Andy Julia's "Carmilla" series. I noticed you made your preference clear, right away! The notes sound intriguing, but any reference to Shalimar makes me cautious... Do you know when les heures will be distributed? This almost sounds like the scent we discussed during the competition for the Parfums 137 set only with a smokey facet... I may just be in love! Les Heures are coming out worldwide in November in Cartier shops (they're already out in NY). Jarvis, why am I not surprised? Another thing that's interesting about it is that "cold leather" effect. It's amazingly subtle and deep. I'm a big fan of Ms. Laurent's creations and this sounds gorgeous. Lovely review as well. How great to interview such talented artists in a medium we love so much. Rappleyea, it *is* really great, and I hope to do more of it in the future. Lyrical review of what sounds like a fascinating scent. It ticks all boxes for me. Funny but I was thinking Bulgari Black when you started with the tea, bergamot vanilla and leather and then up it popped, one of my darlings. Can't wait to sniff this (and the others). Um, any idea how expensive these are to be? Nicola, it's extremely different from Black in that it doesn't have that rubber-opoponax thing going, but if you love one the other could seduce you. Prices, though, I don't know, about $250 for 75 ml...? Exclusive, definitely. I love the I'll wear it on Fridays- it sounds like a Friday scent. Perhaps I will start categorizing scents by days of the week. Bvlgari The Vert Mondays and so on. Rose: well, you know, that way every Friday can be the 13th! 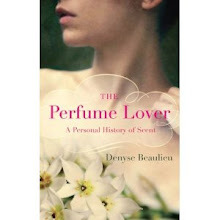 Denyse, thank you for this intriguing group of reviews. La Treizième Heure has me anxiously awaiting the arrival of the entire line. Or maybe I will need to visit New York soon. I think you did me in with the idea of cold leather too. Melissa, on elisabeth de feydeau's blog, Mathilde said that XIII was, with Guet-Apens, the only fragrance of hers that she wore for pleasure... That's an endorsement! I just wanted to let you know that your review helped prompt an excursion to New York today to sniff this one, and it was very much worth the trip! It's fantastic. I loved the lapsang souchong, and I did definitely get a whiff of florals a few phases later. Now, how to beg, borrow, or steal $250?! Natalie, I'm glad you weren't disappointed. But, yeah, that's a lot of $$$... Still don't know when I'll be able to afford more than a sample myself.